What you see: All items present, and all separators visible, but the item text is invisible. What you should see: The menu items are visible. If acroread is linking with a version of gtk that is incompatible with appmenu-gtk, it should be blacklisted as well. With a workaround i think we can lower the priority to medium. Even i am having this issue .. basically the menu is blank ... in whatever color its blank. 11.04 dev i386 - acro read 9. This bug affects me as well. I installed the version inside the partner repository (for Natty) and it looks like we now have the traditional menu back. I take it that this is a temporary workaround (or regression) until we get this fully working? If you mean quit Adobe Reader, type "env UBUNTU_MENUPROXY= acroread" in the terminal and then start Adobe Reader again: no, that does not work. The menu ist still blank. Still waiting for comment from Adobe. Just wanted to say that in an up to date Ubuntu 11.10(i386) with Acrobat Reader 9.4.2, the workaround of launching the propietary software as "env UBUNTU_MENUPROXY= acroread" works, and the software also works for non primary users in the system (that is, users created afterwards), who don't have the environmental variable set. This has already been fixed in acroread's packaging: the startup script contains `UBUNTU_MENUPROXY=0`, which disables the global menu for this application. In precise, the menu is inside the window and all items are visible. I have the problem with Acrobat Reader 9.5.1 & Ubuntu 12.04 LTS 32 bit. Notebook with 1024x600 pixels, Atom processor, 1 GByte RAM. I don't have the problem with Acrobat Reader 9.5.1 & 12.04 LTS 64 bit. Desktop with 1920x1280 pixels, i7 processor, 8 GByte RAM. 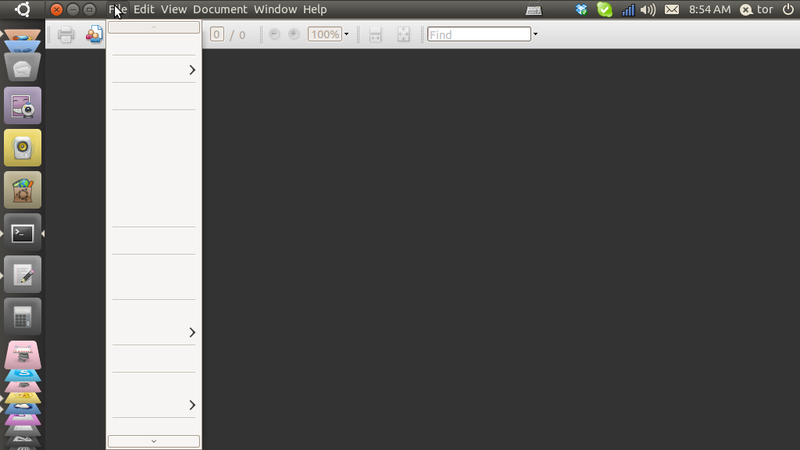 Like this, Acrobat Reader has menus when is called directlly, outside Firefox. I'm sorry. I wanted to say "alacarte" package instead. The problem can be resolved by adding the proposed directive to the desktop launcher file. This does not correct the problem but sends you back to the traditional menu. Would be nice if this could be resolved in the Adobe Reader Installer. This problem is present for me in 12.10 KUBUNTU for Adobe Reader and GNU Cash. GNU Cash has repeated menu items. In the import menu, there are about 10 submenus all showing "convert". Here's another way to get around the problem that works via context menus (right-click->open with, double click PDF, etc). Which package are you referring to exactly? As far as I can tell, there is no acroread package in 12.10 and the adobereader-enu package I see is at version 9.5.1 (bug still present). The problem has been resolved by adding the proposed directive to the desktop launcher file.